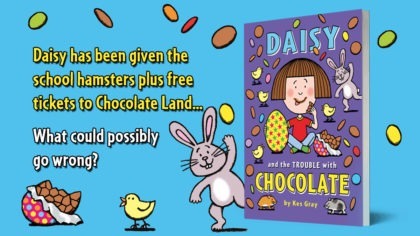 Check out Daisy and the Trouble with Chocolate by Kes Gray! It's the latest book in the Daisy series! Daisy is so excited! She’s been picked to look after the class hamsters, Pickle and Pops, over the Easter holidays – and her mum’s taking her to Chocolate Land! Daisy and the Trouble with Chocolate is the totally troublesome and laugh-out-loud funny new tale from the bestselling Daisy series by Kes Gray! I love all the daisy book but I think this one will be great!